Update (May 9th): Office Online Server is now also available through MSDN here. Update (May 4th): Office Online Server became available today. OOS is available on VLSC, language packs are on MSDN as well (perhaps a clue OOS will be available later on MSDN as well). Document modification option comes with additional licensing requirements, consult the release article for more information. On April 26th, I gave a session on Exchange 2016 and Office Online Server – or OOS. Creating the session contents proved to hold some challenges. After agreeing on the session around the January timeframe, when OOS was still in Technical Preview, OOS got pulled a few weeks ago without notice. It was expected it would become Generally Available (GA) shortly after the release of SharePoint 2016, but that didn’t happen. To make matters more interesting, OOS was moved to Volume Licensing Service Center only, where its predecessor was freely available on the Microsoft download center. Currently, the status of OOS is that it is GA, and available on the VLSC site. The session and demo were based on the Technical Preview. Back to the event, which was hosted by the always friendly and hospitable people from the Belgian E-Communications Community. 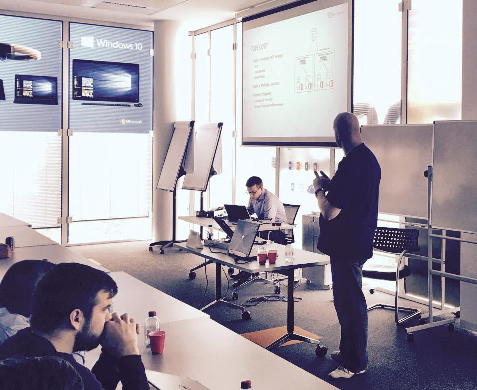 At the office of Microsoft in Zaventem, Belgium, sessions were presented by 8 Microsoft MVP’s, Microsoft and sponsors, divided in 2 tracks: one Exchange-oriented track, and one track with Skype for Business related topics. Around a total of 60 people turned up in person for the event, and sessions were also streamed live through Skype Meeting Broadcast. Excellent usage of available technology. After the opening keynote, Tony Redmond kicked off talking about Office 365 Groups, followed by fellow countryman Dave Stork talking about using Tools to deploy and manage Exchange. After the break, it was time for my session on Exchange 2016 and Office Online Server. Unfortunately, in the category 1st world problems, lack of an HDMI connector – required for presenting as well as streaming – on my laptop prevented me from doing the demo, and the remaining time was filled by a improvised Ask the Experts session on Exchange and Office 365, in which I was joined by the other Dutch MVP’s present. After that, Michael van Horenbeeck talked in his session about Advanced Identity & Authentication scenarios for Office 365. Jaap Wesselius closed the Exchange track with a session on the Do’s and Don’ts when using Exchange 2010 for Hybrid deployments. The links above lead to the session recordings; a complete session overview including links to the recordings for the Skype for Business related sessions can be found here. My slidedeck – with caps of the demo – can be downloaded here. A page with links to all the slidedecks and recordings can be found here. This entry was posted in Exchange 2016, OOS, OWA and tagged Exchange2016, Office Online Server, OOS, WAC, WOPI by Michel de Rooij. Bookmark the permalink. Thanks for the update. Just typical that I urgently need to install an OOS sever!! Now I can’t find any version of the install media – new or old. Still cannot see it on our VLSC.